Like its subject, this painting is a little jewel. It is an object of time, suspended in time, with its tiny, peaceful, circular icons depicted life size on the canvas. You don't have to worry about raising your wrist to keep these visible! I used a shiny metallic paint to depict the shiny stainless steel of the Apple Watch's frame. A background blue glow cradles the watch, highlighting it and representing the cloud of human creativity and ingenuity it has emerged from. I love taking an object of technology and portraying it in an ancient medium like paint. For me, it's like the prehistoric hunter/gatherer artist that's inside of us, meeting the invisible "spirit" world of electrons and software, wrapped up in gleaming polished metal. I take a state-of-the-art object of tech obsession and lock its form into an effigy of pigments, much like our ancient ancestors depicted the animals they depended on and were obsessed with, up on to their cave walls. It's a way to capture and humanize some of that magic, wonder, and joy that the object possesses. Besides being very convenient for display (it can fit on any desk or shelf) the tiny size of the painting insists that you move as close as possible to it to get a good look. It's a very intimate experience, one that not unlike our relationship with the real Apple Watch. You will be able to recognize the apps, as I worked quite hard to get as much detail as possible into that small space. I imagine that's what Apple did when designing the Watch, too. They pay such meticulous attention to every tiny detail, and I wanted to capture that marvelous obsession in the painting. I hope the new owner of this delightful object will enjoy it as much as I do. It looks amazing on the little easel, and it would also look pretty neat with the tiny painting mounted directly on a wall. 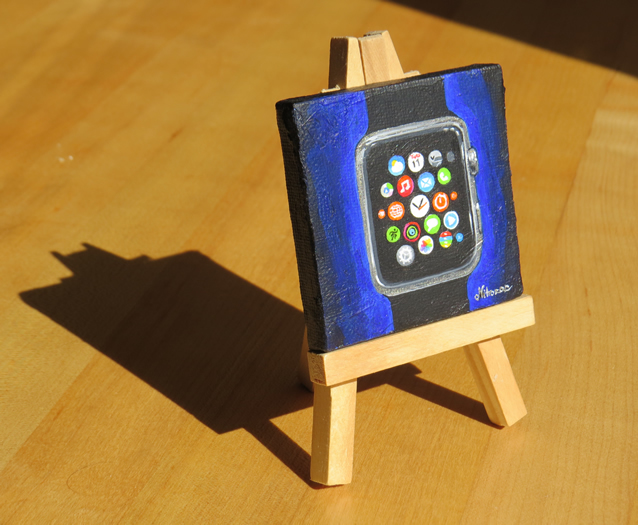 Details: Apple Watch, an original painting, on 2.5 x 2.5 inch stretched canvas, with a wooden frame. The painting is about a quarter inch thick, with painted sides, so you can display it as is, on the wooden frame, or however you wish. The back of the painting contains the title, the date painted, Nitrozac's signature, and a fingerprint for authenticity. Note: Obviously, the item for auction is a painting, and does not include a functioning Apple Watch.